On Saturday I chanced upon one of the most repugnant TV shows I ever saw, one of a series called "Inside E Street." There was a bunch of ordinary people sitting around a table discussing what they called a hoarder disorder, as if it were some kind of disease in need of treatment. So if you hoard things in your home, watch out: the fascists are coming! These nauseating interferers detected a problem: people sometimes accumulate stuff. It's true; in my box room there are things I'll never use again, that ought really to be thrown out, but I never seem to get a round tuit. Apparently, some folk have a much more acute shortage of round tuits than I do, and that caught the attention of these nosey do-gooders. Hoarders accumulate really silly stuff, of no possible use and covered in rust and dust, and don't even stack it in orderly heaps or in closets or on shelves; they strew it around the floor! Go into their homes, there's nowhere safe to tread! Incredible! And the Neatness Nazis, whose members made up the talking heads on that AARP-sponsored program, are resolved to do something about it. One more reason I shall not join the AARP. 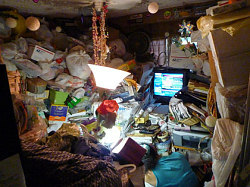 In their calm, matter-of-fact discussion, they noted that there are towns in America that insitute heavy fines for hoarding, and if they get no response they do send actual police to cart stuff away, from inside hoarders' homes! And even to relocate the hoarder (though there was no mention of concentration camps... yet.) I am not making this up! The concern of these anti-accumulation socialists was not to protest the outrage of such home invasions, but to encourage and condition us to expect more! Just once, in the program, there was a ten-second clip of a victim, who said he thought he owned what was in his own house and that he resented the interference and that he thought he lived in America. His remarks did not even register with the social engineers on the discussion panel; members did not even pause to attempt a rebuttal. They continued just as if he had never spoken. Just as if his protest was ridiculous on its face. In the coming zero government society, that wretched man will be able to breathe free and use his house any way he wishes. Of course! It's his! There is a caveat: so will everyone else. Therefore hoarders, like everyone else, must take care not to damage their neighbor's equal right to be left in peace; for otherwise that neighbor would have a grievance to be settled, if need be in a free-market court. How might that happen? - there are a few possible ways. First, if the hoarder strews rusty bikes and appliances and such outside in the yard, that would lower the tone of the neighborhood and quite possibly affect adversely his neighbors' property value. That might fairly be considered an aggressive action. Second, it's possible (but by no means certain) that failure to keep even the inside of a house reasonably clean could foster plagues of rats, mice and other pests and bugs that could migrate next door and bring harm and disease; that too might bring grounds for complaint. Thirdly, if the hoarder keeps pets as well as rubbish in-house, there might be a question of cruelty to animals. I don't say that any of these would necessarily be upheld, but they might. The key thing would be a claim that the hoarder is doing harm to someone else; and if that is missing, there is no case to answer. It is utterly appalling that those panelists could even contemplate telling someone what to do in their own homes, yet they not only did so but they noted that the force of government is already in action to do more. That is a natural outcome of having government. Once established, there is no logical way its powers can be limited. They will for ever gradually increase, until we are all enslaved. It cannot be constrained, it must be terminated outright, like the deadly poison it is.